In Taiwan 362 secondary school students were randomly divided into 4 groups, a TM group and 3 control groups. The 3 control groups included: 1) a resting group, 2) a group practicing contemplation meditation, and 3) a group which received no specific attention. 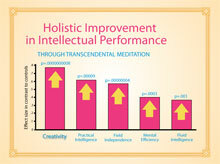 After 6 to 12 months the TM group showed a significant improvement in 5 different scales of intellectual capability, including a scale for “whole brain creativity” as compared to the 3 control groups. The difference in growth was so significant and so consistent that the probability of chance was 1 in 1.2 billion p=.0000000008. (what is a p-value?) The TM students also showed a significant decrease in stress symptoms.